My mom, Ruth Gregerson Tyler, was born in Boise during the Depression but I don’t think she ever understood how tight money was. Her father worked as a Greyhound bus mechanic, a steady job since people still needed to get around, even in bad times. Her mother cooked and canned vegetables from the family’s Victory Garden. When they needed meat, my grandfather simply ventured out with his hunting rifle or fishing pole. Grandpa could fix or build just about anything. The son of a Norwegian carpenter, he learned skills which would provide for his mother and siblings, and eventually his own family. If Grandpa couldn’t buy it, he usually could make it. My mom was the only one of her friends at Boise High School who owned her own car. Grandpa had assembled the 1941 Chevrolet Coupe from scrap parts of wrecked vehicles. Mom’s earliest memories of visiting McCall are Brownie and Girl Scout camping trips. Mom was thrilled when her parents signed a 100-year lease for a second-tier lot off Warren Wagon Road. Beginning in 1946, they paid $12.50 per year for land rights. 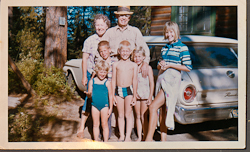 For a blue-color family like Mom’s to have a Payette Lake cabin was something remarkable. 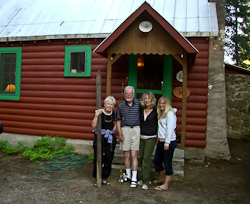 Mom didn’t know it, but her parents had ulterior motives for building the cabin. Mom’s brother, my Uncle Ralph, had recently been released from Korean War duty. The government had granted Uncle Ralph a stipend that burned a hole in his pocket. Grandpa had witnessed other young men party away their money and he didn’t want to see that happen with his son. Grandpa decided that building a cabin together would be a good project to keep Ralph out of trouble. And it did. Grandpa and Uncle Ralph may have set a record for economical cabin construction. They had only $600 to invest in materials. Fortunately they also had brains, brawn, and a talent for acquiring supplies for next-to-nothing. Every weekend, the family drove up from Boise to work. While some early cabins used four big rocks as ground support, Grandpa poured a solid cement foundation. They splurged on fine pine woods from McCall’s mill: knotty for the paneling, acclimated planks for the flooring, and exterior siding cut and fit together to resemble logs. Grandpa scoured second-hand stores in Boise for deals on light fixtures, doors and windows. Grandpa crafted the kitchen cabinetry and counters by hand. Grandma sewed the curtains and purchased quality used furniture. Grandpa and Uncle Ralph dug an 18-foot well, shovel by shovel. My mom applied layers of varnish and orange stain to interior pine walls and woodwork. The orange color, popular in the 1940s, grows more vibrant each decade. 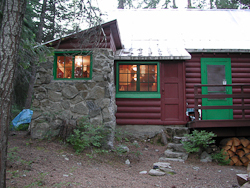 The cabin had no insulation, no phone, and no heat beyond the massive fireplace--its rocks stacked like jigsaw pieces. And they had no bathroom, just a two-seater outhouse. Meanwhile, my mom responded to a newspaper advertisement for a summertime nanny position in McCall. Noted Idahoan, Lulu McDonald, needed help caring for her grandchildren at her Sylvan Beach home. Lulu selected my mother from one hundred Boise high school girl applicants, partly because Mom knew McCall. Lulu treated Mom kindly, and for three summers, Mom watched over little Jean, Bill and Choppy (Ann) Gorrisen. She stayed in their guest quarters and shuttled the children around town in Lulu’s green Buick convertible. Mom spent weekends at her family’s cabin and had friends over for Fourth of July celebrations. Mom never stayed at the cabin in the winter—it wasn’t designed for the cold-- but her family did make day trips to Little Ski Hill. Mom also continued participating in Payette Lake Girl Scout trips. During her senior year, Mom’s troop crossed the frozen lake from Pilgrim’s Cove to Camp Alice Pittenger. They hiked on snowshoes and carried sleeping bags and food by toboggan. My grandfather built the toboggan using old skis for a base. One ski came from a G.I.Joe’s post-war surplus store. The other, Grandpa made. The girls slept overnight before a roaring fire at the Girl Scout lodge. The trip would have been perfect except the Scouts hadn’t taken into consideration that raw eggs might freeze on a journey across the lake. The toboggan wasn’t Grandpa’s only Payette Lake plaything-project. He and Uncle Ralph manufactured a water-ski boat from a complicated mail-order kit, complete with white varnished wood and inboard motor. Unfortunately it lacked reverse transmission, so when they approached a dock too quickly, they crashed. Repeatedly. Eventually they added the reverse. In 1950, McCall’s sawmill hired Uncle Ralph for the winter season. 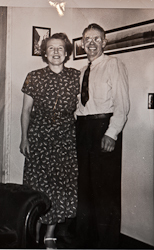 He and his bride, my Aunt Verley, made their first home in the cabin. Grandpa and Ralph hastily assembled a small bathroom, gathering whatever rocks they could find for walls. I asked Ralph why they placed so many windows in the bathroom. He laughed and said they probably got the old windows for free, and more windows meant hauling fewer rocks for walls. They installed a used oil furnace to prevent the young couple from freezing. Ralph describes how he returned home one chilly day to encounter Verley wearing shorts, the furnace blasting. Grandma and Grandpa worried that the newlyweds would burn the place down. My parents own the cabin now, and I’ve visited nearly every summer of my fifty years. My earliest childhood McCall memories invoke scenes that might have inspired Norman Rockwell to his easel. Grandpa reads his Idaho Statesman on the couch in the living room. He recounts real-life adventures involving pistols or grizzly bears, stories which my mother would never have told us. Grandma frets over us grandchildren while popping a roast in the oven and whipping up Idaho spuds and gravy. My four siblings and I would be down at the lake. By day, we’d create sandcastles and swim to Picnic Point. By night, we’d build bonfires and set “baby boat” candles afloat across Payette Lake. Not much has changed at our cabin since 1947. Today, a fourth generation of children arrives each summer to splash and dip in the lake. At night, they sleep under the upstairs eaves, cuddling under blankets hand-stitched by my grandparents. They discover bygone dolls and puzzles and wind-up cars in the built-in toy chest beside the fireplace. A photo sits on the mantle: Grandma and Grandpa look out, pleased. Our only significant cabin change occurred last year when we replaced the bathroom lean-to. We figured since it was an add-on, updating wouldn’t alter the integrity of the place too much. Plus we fancied a real shower and a washer and dryer. We hired a local builder, Brian Rebman, who recognized our vision and matched our cabin’s style, wood, and colors so carefully that it’s difficult to tell the old from new. I think my grandpa would have approved of young Brian, a skilled and creative carpenter like himself. Grandpa wasn’t around to build us a new bathroom himself, but it’s almost like he did. Few original cabins survive Payette Lake anymore. 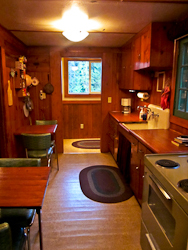 Today’s real estate ads feature them as “vintage” cabins. Overnight, they’ve transformed from dated to desirable, probably due to their scarcity. We’re in rare company as single-family owners of one of these gems. And we have no plans to sell. For us, the cabin is not simply a collection of wood and nails; it embodies the love and lives of all who have enjoyed it over the years. It’s our personal vintage. Sixty-five years have passed since the cabin’s construction. If my grandparents were alive, they’d feel right at home. They’d find the same living room lamp and brown upholstered easy chairs. 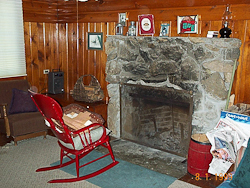 Their old red rocker sways opposite the rock fireplace. Last summer, we mounted Grandpa’s hand-carved toboggan ski above the mantle. The outhouse stands sentinel in the backyard, though it now functions as a storage shed. The city of McCall filled the pit some years ago, but left untouched Uncle Ralph’s signs for “ladies” and “gents” over each hole. Back inside the cabin, Grandma’s sunhat dangles by the rear door, ready for an afternoon of huckleberry picking. In the kitchen, her cookbooks and crockery fill Grandpa’s cabinetry. Her spice rack hangs on the wall. Her apron, tucked in a drawer. Upstairs, mattresses rest in custom knotty-pine frames. Grandpa made the frames, of course. The orange pine glimmers in the morning sun.